Everybody knows there’s nothing that says “knee-slapping hilarity” like the carefree funnymen of the Republican party. Whether it’s some good-natured ribbing between colleagues, or a zany attempt to disassemble the American healthcare system, those guys just love to laugh, and to share those laughs in a human way with the other human beings around them. So when right-wing kings of comedy Ted Cruz and Ben Sasse ended up seated next to each other at a Senate Judiciary Committee meeting today, you had to know it was comedy alchemy just waiting to happen. And happen it did, when a simple spilled Dr. Pepper escalated into a Twitter back-and-forth that ended with Sasse joking that Cruz’s dad shot John F. Kennedy, and Cruz finally admitting his identity as the Zodiac Killer. You know: Good, simple fun. Sasse, of course, made his comedy bones earlier this year, rocking the senatorial boat by appearing in public wearing gym shorts, of all things, and also by laughing politely when Bill Maher spouted a racial slur in front of him on national TV. 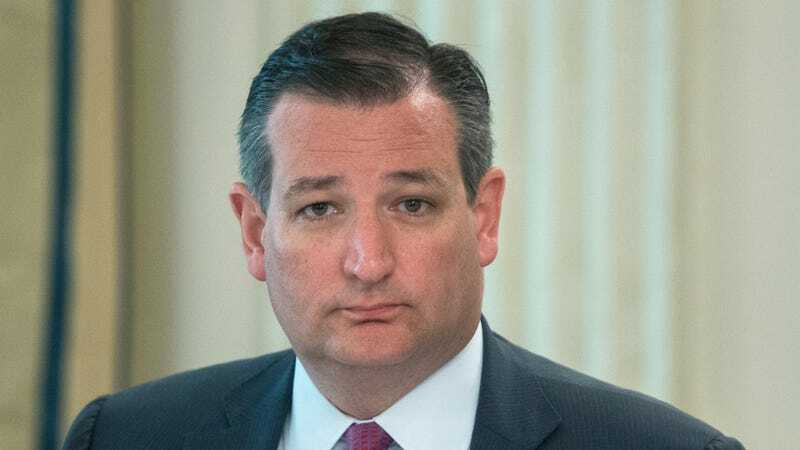 Cruz, meanwhile, has been widely celebrated for his hilarious impression of a viable presidential candidate, as well as his dogged pursuit of this thing you human beings call “jokes.” Thus, when Sasse spilled his soda on Cruz during the session, the Texas senator was quick to fire back, tweeting a picture of his office’s apparently well-stocked Dr. Pepper fridge, with a fake memo poking fun at Sasse’s clumsiness. Apparently deciding, “Sure, why not?” Cruz—who is, we feel compelled to remind you, a sitting U.S. Senator—then played along with this bizarrely meme-laden avenue by referencing a different mean-spirited internet joke about himself, firing back by tweeting out a letter famously sent by the infamous Zodiac Killer, who he’s frequently been jokingly accused of being. It was a very weird day today on Twitter, is what we’re trying to express. Meanwhile, somewhere out there Mike Huckabee is presumably kicking himself for not getting in on all this good Republican comedy gold.